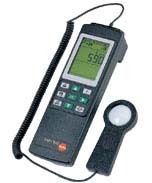 testo 545 testo 545, light meter, incl. probe, battery and calibration protocol In order to have good quality light, luminous intensity in the workplace, hospitals, offices or schools has to fulfill specific minimum guidelines. This can be checked using testo 545. Multi-point or timed mean calculation Stores up to 99 file locations Logger function (3000 readings). 357 TruReward$ points will be placed in your account when you buy this item.